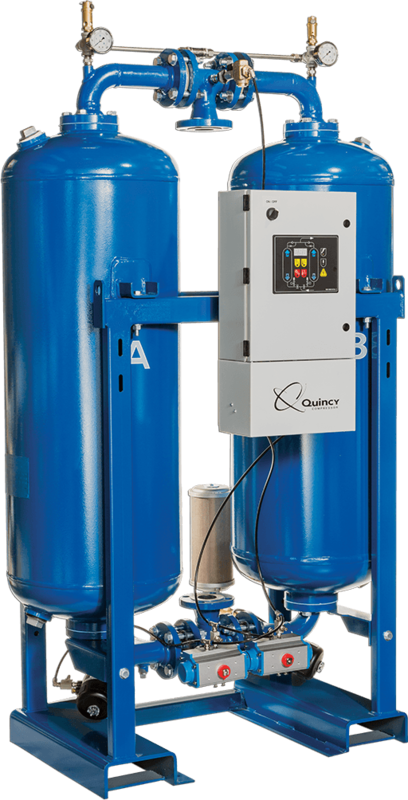 Quincy QHD heatless desiccant dryers use a small portion of dried, compressed air to purge and regenerate the off-line tower. The QHD has been engineered to ensure optimal performance and efficiency in a range of different applications while keeping downtime to a minimum. The QHD series of desiccant dryer systems includes 13 models that deliver between 230 and 3,400 CFM of clean, dry air at a pressure of 100 psig. All feature a heavy-duty steel base and dual tower configuration that regenerates automatically. Under normal operation, air is forced upwards through the drying tower, where moisture and contaminants are removed and a small amount — 15% — of air is diverted downwards through the regeneration tower where it depressurizes the desiccant bed to ambient conditions. Overall velocities are kept below 50 feet/minute so that air remains in contact with the desiccant for a minimum of 4.5 seconds. The entire process follows a 6-10 minute NEMA cycle, which consists of three to five minutes of drying time, 2 minutes and 25 seconds to 4 minutes and 20 seconds of regeneration and 40 seconds of re-pressurization. Like all our desiccant-type air dryers, the QHD heatless air dryer system includes high-quality components and is backed by a two-year comprehensive warranty. 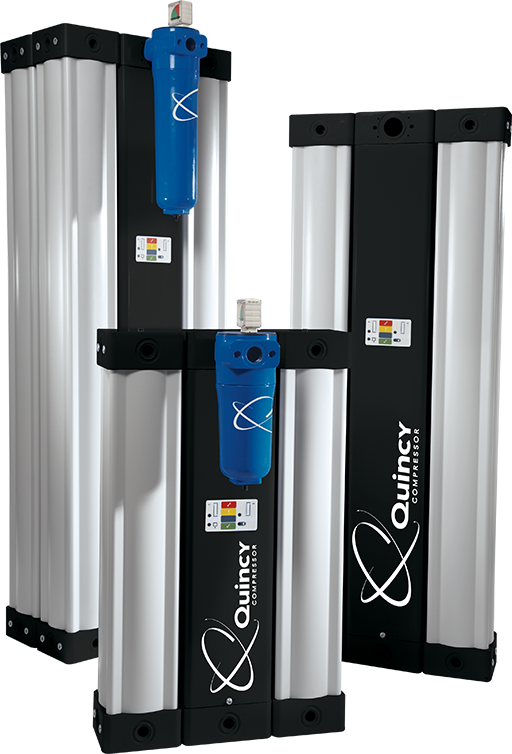 For details, download the product brochure or contact a Quincy rep directly. The QHP series of heated desiccant dryers features a built-in heating system that regenerates the offline tower using half the amount of air as our heatless products. This translates to improved efficiency, less wear and lower operating costs overall. Nine configurations are available that can deliver between 850 and 3,400 CFM of dry air at 100 psig. Key components include the same high-performance switching valve system found in the QHD and a heavy-duty steel base. From the ground up, the QHD has been designed to ensure long life and low maintenance requirements, even when operating at high temperatures. 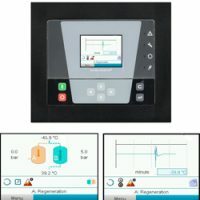 Operation is similar to the QHD, with the distinction that purged air passes through a heater before beginning the regeneration process. Because the air is hotter, less is required to absorb moisture from the desiccant beads. Air is forced through the system at a maximum of 50 feet/second, with up to 5.5 seconds of desiccant contact time during the drying phase. 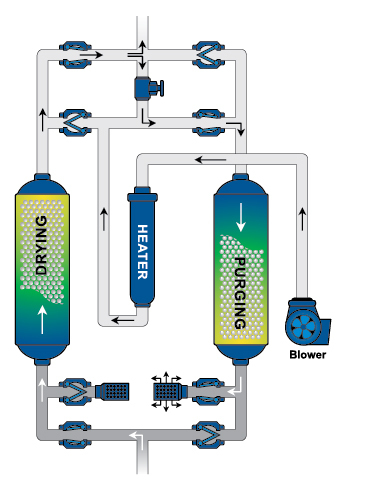 QHP industrial desiccant air dryers run on an eight-hour NEMA cycle. The drying phase lasts four hours, the heating phase two and a half hours, the cooling phase one hour and twenty minutes and the re-pressurizing phase 10 minutes. The QHP is available with the optional Quincy MicroBurst Regeneration (MBR) system, the only full-load energy saver available for use with heated purge desiccant air dryers. The MBR cuts purge requirements in half and greatly reduces heater “on” time. When equipped with the Quincy MBR, our Heated Purge dryers use 50% less energy. ROI can be realized within five months depending on dryer size and local power costs. Quincy QBP dryers combine heat with forced ambient air for regeneration. As a result, they have a lower purge requirement than both the QHD and QHP desiccant dryer systems. The QBP is available in 13 different configurations that can produce between 210 and 3,400 CFM of dry air at 100 psig. While they are more expensive to purchase outright than other models, a QBP dryer’s lower ownership and maintenance costs deliver a strong ROI over the life of the product. After air has passed through the drying tower, a small amount is heated and blown down through the purge tower, where moisture is removed from the desiccant. The blower component improves the overall efficiency of this process, requiring less air to perform the same amount of work. Sophisticated electronic controls and regulators automate the cycle, making it worry- and maintenance-free. Average purge levels are kept to 1.75%. 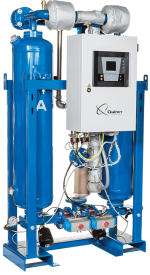 The Quincy QMOD is one of our most advanced desiccant dryer systems. Like the QHD series of products, these compact dryers use a portion of dried compressed air to regenerate the offline tower. Their small footprint has been designed to save floor space without compromising performance or efficiency, making them ideal for use in a crowded lab or tight compressor room. Use the QMOD dryer to remove moisture, aerosols and mist from a stream of compressed air. A 0.01 PPM polishing pre-filter removes large impurities, while the unit’s specially designed purification cartridges contain a high-performance desiccant and after-filter that completely removes remaining water vapors. 15 available models accept input from NPT pipe sizes between ⅜” and 1½”, at flow rates from eight to 365 SCFM. A sophisticated electronic diagnostic and control center puts cycle information and other useful tools right at your fingertips, keeping operation and maintenance safe and simple. Install the QMOD air desiccant dryer horizontally or vertically for maximum flexibility. A true modular system, the QMOD can be counted on to deliver instrument-quality compressed air in practically any situation. Quincy Compressors has been in business since 1920. Our products are designed to work together to provide a complete compressed air solution for any heavy-duty or industrial application. Our current line of products includes heatless, heated purge, blower purge and modular desiccants. Contact a sales representative in your area for assistance.